Are Unflued Gas Heaters A Health Risk? 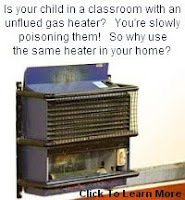 The answer to these unflued gas heaters being a health risk for many people, is YES! Why is it that these heaters are banned in so many places, in so many countries! Did you read your operation manual fully when you bought your unflued gas heater? If not, you may have missed the section where it stipulates, you must operate the unflued gas heater with a window open! There is no question according to research found easily on the internet, about unflued gas heaters producing several by-products which are harmful to human health, at all ages! Why are these heaters banned in so many places? Pick you poison carefully! Read this report Unflued Gas Heaters - Why Are You Putting Your Health At Risk? Nearly all the homes we have taken our Home Energy Assessment Services to, are operating these unflued gas heaters in non-ventilated rooms. And the householders are totally unaware of any ventilation requirement. Should their health be penalised because they did not read the operating instructions? That is a very weak argument from the manufacturer of these toxic heating devices! Further information on the effects of unflued gas heaters is available on the Federal Government's Department of Health & Ageing's website. Visit their website to read the report on 'The Health Effects Of Unflued Gas Heater Use In Australia'.